Salam & Heloooo everyone! Today Wishlist Wednesday gonna be a lil different. Not makeup - not fashion. It is one of my favorite and top search on YouTube! Organizations! I am a messy person, trust me. But I love love love to get organize. When I started to clutter things around I always find the best way that help me to do less clutter if that make sense? I change the way I organize things quite frequently. As for now I am still not yet officially have a proper room for all of my things. In sya Allah, in 2 years time if I can afford my own house, I would totally have all my dream space as what I really wanted. One of my dream section would be the "Accessories Section". I want a section when I store all of my "last touch up" to what I am dress on that day. I love jewelry, but the main problem is I don't have a proper place to store and in the result I lost them and they may have been spoiled. I would love this section concludes all of my accessories displayed and stored nicely like a boutique inspired section. I want a fabric mannequin, probably will do some project on this. I don't want the fabric to be plain white (kinda scary), I probably will makeover this mannequin to a more stylish look with some colored fabric help. This will hold all of my necklaces especially the long ones. Since its a fabric I can also store my favorite or special brooches there. A big rectangle (preferred the same width as the Malm drawer) silver or I call a chrome mirror would be just fabulous there. A glance of what I am wearing and a convenient mirror while I am wearing my hijab would be totally nice. 1st drawer : Extra accessories, cluttered type of pins and small hijab accessories. I have been influence by AnnieJaffrey Organization Ideas. I just love how the amount of jewerly she had and how she display and store it. This kind of display also help you get your stuff in and out easily. I would proably store my watches and bracelet here. This will concluded my small accesories such as brooches and rings! The suede organizer make it looks more nicer and neat. saya suka wishlist sab kali ni sebab ada beberapa wishlist kita sama. hehe.. saya nak sangat mannequin. dah survey harga tapi agak pricey la pula dalam RM500. huhu...mcm acrylic 2 drawers dan bracelet holder pun agak pricey. haha.. saya suka IKEA sebab design nice sangat. I wish IKEA ada di tempat saya. 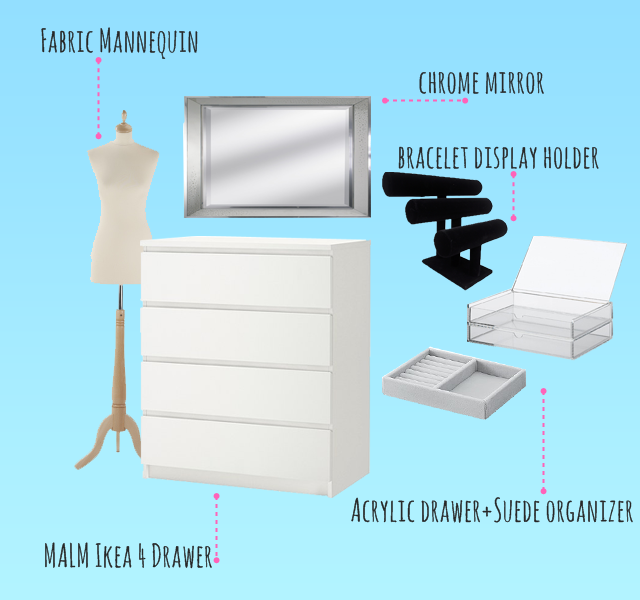 hewhew..
Wow, menarik jea semua brg2 ni..asyik suka mannequin dan suede organizer..
p/s: The acrylic drawer is super tempting!! so we have the same wishlist! yayy :D hehe btw can i ask you something, how to edit the picture like you and what font you use?